Upgrades to the Steber boats favourite improves the Steber 2200’s performance and fishing ability. There’s protection from the elements, somewhere to sleep and room for electronics. Steber has placed the fuel tank amidships, which leaves lots of room for storage in the aft hold. Steber have made some improvements to their popular 7m shaft and stern drive sportfisher. It was already a unique offshore boat; now, it’s even better. Having previously owned a Steber 2200 offshore for some two-and-a-half years, I was well aware of the performance of this versatile vessel and was initially attracted by its capacity as an entry-level, shaft-driven (or stern-drive) boat that could be legally trailered. the low maintenance required of a turbo diesel and shaft-drive set-up was also appealing. I liked my 2200, and sold it for purely financial reasons. So it was with a great deal of background knowledge that I appraised the Steber 2200 offshore MKII. Bruce and Alan Steber are renowned Australian recreational and commercial boatbuilders and it was their personal input that established the criteria for the upgrade of the 6.95m boat. 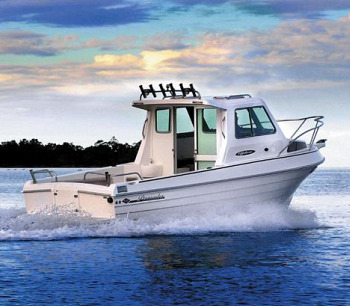 The 2200 offshore is best described as a small big-boat rather than a big small-boat. That is to say, it performs more like a larger vessel than a true trailerboat. Boats of this configuration in the same size are few and far between, despite the overabundance of most other boat styles on the Aussie market. I like to refer to it as a crossover boat: one that is portable, but still offers many attributes of much larger vessels. The changes that Bruce and Alan settled on included the additions of improved landing platform supports, black window frames as standard, larger opening side windows, larger diameter shafting, improved exhaust system, poly fuel tanks, low maintenance GEL batteries, added storage, So-Pac lockers, LED lights, larger overhead cabin hatches, two-tone gelcoat on the deck and a number of other changes. The changes have improved both the boat’s performance and its functionality. One aspect that particular impressed me (with my intimate knowledge of this model) was the improved exhaust system. Basically, instead of an expensive and restrictive (from an exhaust-flow perspective) water-stop in the system, a taller engine box can accommodate a vertical bend in the exhaust, preventing water from intruding back into the engine from the exhaust outlet. This also ensures exhaust back-pressure is absolutely minimal, allowing for better engine performance. Larger overhead hatches offer greater safety in case of an emergency; the extended bow rail offers easier and safer bow access; and poly fuel tanks have been moved to amidships, which allows for either extended fuel capacity or extra storage options in the aft hold. All in all, every change is an advancement on the previous model. What places this vessel in a league of its own is its spacious and uncluttered layout, combined with its shaft-driven turbo diesel powering option. In short, the 2200 offshore is built on a strong, clinker-style fibreglass hull with an expansive lockable cabin that has a full bulkhead separating the wheelhouse from the bunkroom. This offers comfortable protection from the weather and gives way to an open and tidy cockpit. It has that magical mix of comfort and a clean, open workspace that all bluewater anglers dream of. The forward cabin has port and starboard shelves with vinyl-covered retainers, twin vinyl-upholstered bunks with storage under each and the option of a V-berth infill that creates a large, open bunk. There is a recessed area for the fitment of a chemical toilet if required, a carpeted floor, a bulkhead light and a large forward hatch for bow and anchor compartment access. Back in the wheelhouse, superb vision is offered via three forward-facing toughened glass windows, port and starboard sliding windows and fixed rear port and starboard porthole windows. A moulded helm console harbours the Yanmar engine gauges and fuel gauge. Heavy teleflex steering delivers light steering as it only services a rudder in the shaft-driven versions. The vinyl-upholstered helm and passenger seats sit atop seat boxes offering storage that is complemented by further storage in side lockers. The wheelhouse also has a carpeted floor, overhead forward-facing roof vents, side grab rails, an access hatch to the bilge, compass, bulkhead lighting and various other necessities. It is comfortable, functional and roomy. The cockpit comes standard with a central transom door and large swim platform. The cockpit is fully moulded with moulded hatches. It is a very neat and tidy layout with no intrusions to hinder access or movement. The central engine box creates a perfect seat or workstation. Port and starboard scuppers allow any water that enters the cockpit to drain, while recessed side pockets allow for storage of long objects such as gaffs and tag poles. Further open storage is supplied by recessed transom shelves, an aft hatch and a So-Pac storage locker on the forward starboard side. Opposite this is a portside sink with tap/shower. Side steps allow access to the narrow gunwale that runs beside the wheelhouse/cabin. Roof-top grab rails and the bow rail—offer safe access to the bow. This particular boat had grab rails extending across the transom from the edges of the transom door and part of the way along the port and starboard cockpit gunwales. I would have preferred the optional longer rails that run forward to within reach of the wheelhouse. All in all, though, this is a dream cockpit layout for fishing—I know from experience! While this particular boat test was carried out in the protection of the Hastings River, I intimately know the performance of this hull in all sea conditions—it performs more like a vessel half as large again. It is soft riding and is stable at rest and when underway. The boat tested delivered better performance than the 2200 I owned. I think this is due to the improved exhaust system and better weight distribution. It reached a top speed of 22.7 knots, produced an impressive general running speed of 18 knots at 3400rpm, and amazing economy at this speed of one nautical mile per litre of fuel. That equates to very cheap running for a 22ft vessel. Further economy is delivered in the low running and maintenance costs of a turbo diesel shaft-drive.